During summer it always feels like a holiday being here. Even when we lived here. For some reason, I associate the summer weather with all the tourist attractions. It has been a few years since we spent more than a quick stop-over in London around this time of year. Winter-London feels like I'm back home. Many old memories of frost, coats, scarves, hats and numb toes. 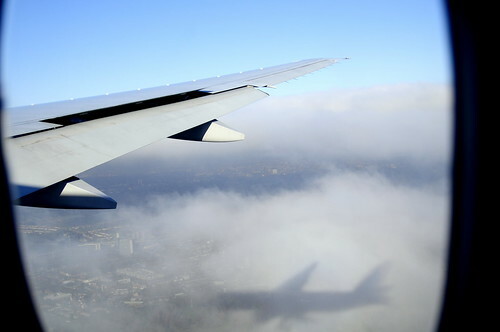 During our final approach into London's Heathrow, I saw our 777 perfectly drawn onto the clouds. For those familiar with the area, you can just see the GlaxoSmithKline building in the centre left.